Forty years ago, 250,000 people gathered peacefully in front of the Lincoln Memorial in Washington DC to demand equal rights for black Americans. It was a watershed moment for the civil rights movement and became the most vaunted protest in American history. On a sweltering summer's day on 28 August, 1963, Martin Luther King delivered his magnificent "I have a dream" speech, which is often remembered as the overwhelming inspiration of the day. It reached millions of white Americans watching the march on TV and opened their eyes to the injustices millions of black Americans were suffering. It helped galvanise people of all races and create an unprecedented bipartisan coalition for anti-racist legislation. Dr King was the national leader of the civil rights movement, but what of the ordinary people who were caught up in this extraordinary movement? What of the anonymous "foot soldiers" who had joined the non-violent army? They had risked much during their campaigns - boycotting segregated buses, staging sit-ins at white-only lunch counters and white-only schools, marching for their voting rights. Many had been kicked, beaten and thrown in jail. Over the following pages, such foot soldiers remember the March on Washington, and describe their expectations, achievements, and disappointments. We also hear from a woman, who at the age of 15, went alone to the march and later went in search of the Black Panthers, a "black power" movement which espoused the rhetoric of violent self-defence. 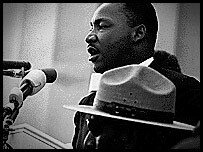 By the mid-1960s, a number of civil rights leaders had repudiated Dr King's non-violent approach and ideal of integration. He fought a pivotal battle in Birmingham, Alabama, during which police dogs and fire hoses were turned on black marchers. She was a child of the movement, one of the numerous teenagers who took to the streets and filled the jails. He campaigned in the south for civil rights and, later in the north, for economic rights. He worked on the co-ordinating committee for the march. She was one of the few white northerners to go south to campaign in the name of freedom. She says the march was the beginning of her life-long dedication to social action.